Being an entrepreneur means knowing when to do the work yourself, versus delegating work to others. It can be difficult to make this decision, because most entrepreneurs are invested in making sure everything at their company is perfect. On the other hand, some employers will hire people just to bark orders at them all day. Neither is the correct approach to distributing responsibilities, so let me explain how to determine whether or not you should delegate a duty, as well as how to avoid running your business like a dictatorship. Who would complete this efficiently? We all have our strengths and weaknesses. If you start a business, you’re likely hardworking, productive, and charismatic (at least about your company). You also may have the ability to expertly negotiate, hire a great team, and manage your time wisely. However, when it comes to specific projects, such as marketing or web design, you may not have the skills necessary to complete the project efficiently. Sure, you can learn on your own, but it may cost you precious time that you could use elsewhere. Instead, consider whether a professional could step in and take the burden from you. One way many leaders can fall into the dictator trap is by giving orders. While wishy-washy talk can also leave you hanging, you should strive to find a compromise that lies somewhere in between. State something like, “I really need someone to work on this project for me. I think you are the right person to help me. Can you handle this alongside your other duties?” This lets your employees know that they are required to complete this project, but you are understanding if they need help covering other duties. You also should follow through, especially if they are swamped and you place a huge responsibility on them. Is this a top priority? Some aspects of a business are more important than others. For example, meetings with investors mean more than checking your website for grammatical errors. High-importance tasks should be handled by you or another executive employee, while menial tasks can be displaced amongst your staff. Don’t waste time on low-priority duties if you can avoid them. A great way to avoid sounding demanding is to offer gratitude to your employees. This is especially important if someone goes out of their way to get their work and an extra project completed for you. Another key opportunity for gratitude is when someone works late to complete their to-do list. Make sure to give thanks to employees who go above and beyond for you. They are likely to help you out in the future and have a positive attitude about their work experience. 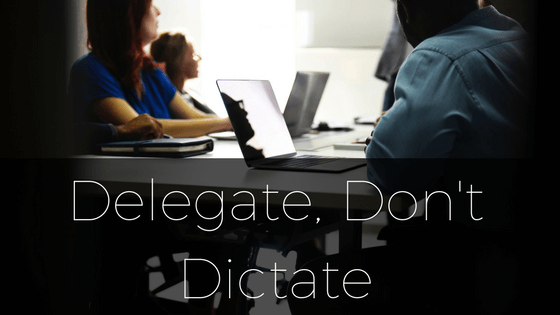 While it is important to delegate your tasks, it is also key to avoid dictating them. Your employees should feel respected by you and want to help you, but that starts with your treatment of them. Furthermore, it is crucial to ask for help every so often. Understanding the balance between these aspects will lead you to greater success as an entrepreneur.